to warm up doing football movements with and without the ball. 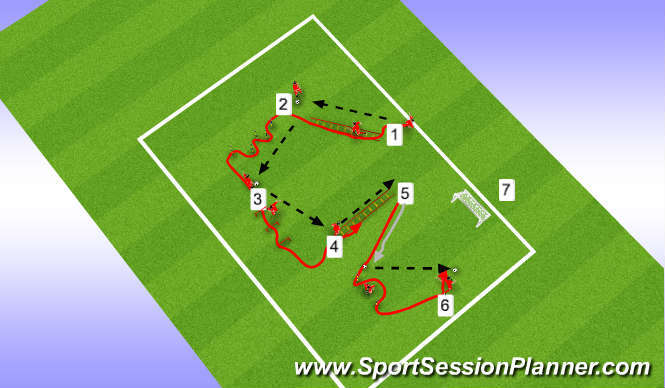 player starts at station 1 passes the ball to player at next station then runs through ladders linear, once through then turns around and awaits next ball in. Player who recieves at station 2 turns and passes to player at next station then proceeds through poles to next station. station 3 player once recieved the ball from station 2 then passes to station 4 then double hops over small hurdles, ready to recieve at start of next station. player at station 4 once passed to station 5 player runs through hurdles 2 feet per rung. Player at station 5 dribbles with ball then passes ball diagonaly to station 6 then proceeds through poles, once through poles then runs onto pass and shoots. player after shooting jogs to station 7, player then performs 3 deep squats followed by 3 lunges forward and side. whilst moving toward station 1 to repeat circuit this time when travelling through ladders and poles will move laterally with left foot leading with pass off the right foot. once this is done then player repeats circuit with right foot leading laterally and passing with left foot.